The .docx format used by Microsoft is actually a collection of XML files (and other files) and can be opened with zip. Now you've extracted the .docx file into a new directory called foo. You can go in there and poke around at the .xml files. But what happens when you want to put the whole thing back together? "No problem," you might think. "I'll just use the handy-dandy Compress service to do that." 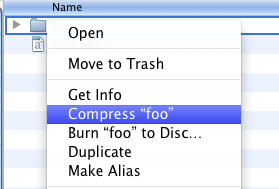 Then just rename it to foo.docx and we're all done! But...wait. Now you're ready to take the gloves off. "I'll just do it at the command line!" Aargh! So what's the secret? Here's the secret: cd into the directory first, then build your zip archive outside the directory. Here we cd into foo and make bar.zip in the directory above, then rename it to bar.docx. Presto! 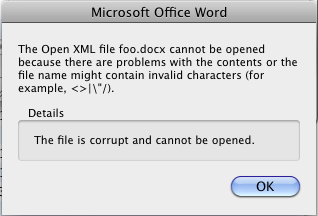 The .docx file opens up in Word with no corruption. Permalink Submitted by vinay (not verified) on Mon, 2012-01-16 08:06. I just got introduced to OpenXML, this is great information for beginners like me who like to experiment with the structure. I've an additional question, is there any specific compression level we need to use with the DEFLATE compression mode. I mean, if I am correct, the specification does not talk about the compression level, so does this mean that such applications(MS Word 2010) should support all available levels of compression for this mode(DEFLATE)? I am not sure whether you are going to look at this, just hoping you might have some information on this if you take a look at this. Permalink Submitted by Anonymous (not verified) on Mon, 2012-11-05 17:51.